An SEI analysis finds that offshore drilling in U.S. Arctic and Atlantic waters would only be consistent with a pathway that leads to 4°C of warming, not less than 2°C, as world leaders have agreed. Offshore drilling in the Atlantic and Arctic Oceans would conflict with efforts to keep global warming under 2°C that the U.S. and world leaders agreed to in Paris last year, new analysis by SEI shows. The study, prepared by Seattle-based researchers at SEI in cooperation with the Carbon Tracker Initiative, also finds that the U.S. already has “more than enough domestic oil from other sources” to meet all U.S. oil production needs consistent with a 2°C climate pathway, without expanding federal offshore oil production. President Obama is on the brink of making final decisions about offshore drilling and the use of federal lands and their role in addressing climate change. SEI’s analysis finds that, since new offshore oil is not needed, the U.S. could stop issuing new leases for offshore oil development in federal waters, “as a contribution towards aligning national energy development with a 2°C pathway”. Such an action would also “send a strong signal to other nations that are similarly committed to the Paris Agreement but still exploring for offshore oil”, the authors write. The study also cautions about two related risks in allowing further U.S. offshore oil development: “carbon lock-in”, and “stranded assets”. At the same time, if global demand for oil declines, as would be expected on a 2°C pathway, the authors warn, offshore oil investments could easily become “stranded” – meaning they fail to achieve the expected returns, potentially creating economic losses for investors and local communities. U.S. offshore oil resources by status of lease and average break-even oil price. Click to enlarge. • U.S. oil production would fall steadily should the world pursue a cost-efficient 2°C pathway, by at least 40-50% below current levels by 2040. 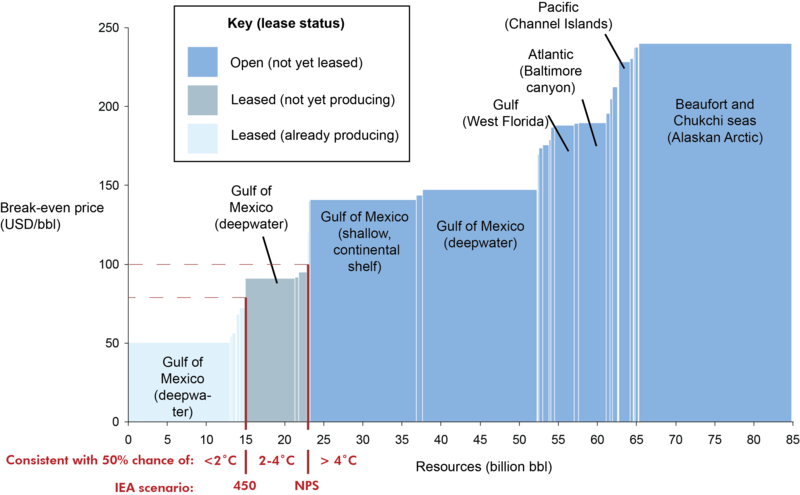 • New U.S. offshore oil is neither needed nor consistent with a 2°C pathway, since offshore projects are costly and highly capital-intensive, likely requiring oil prices of $140 per barrel or more to justify investment. In a 2°C world, oil demand would be expected to fall, and prices would likely stay low as well. Furthermore, meeting a 2°C limit means limiting CO2 to a cumulative carbon budget. Any CO2 associated with new offshore oil projects would thus need to be made up elsewhere by projects not being developed. Economic efficiency would suggest that, given the higher expense of offshore oil, it should be the last priority for new development. • The leasing and development of new U.S. offshore oil implicitly assumes that the world is on a pathway for at least 4°C of warming – a level that the Intergovernmental Panel on Climate Change finds would bring substantial new risks to ecosystems, water supply, food security and human health. • Investment in new, capital-intensive offshore oil expands supply and creates carbon lock-in that makes it ever harder to limit warming, owing to the resilience of offshore oil supply to subsequent drops in oil demand and prices and the strengthening of the political, institutional and technical structures that sustain it.